What is, The Tortoise Diary ? We can't stress how important preventative measures are, after all the emails we receive from tortoise keepers at there wits end with an already ill tortoise... Not to say we can simply prevent any ill health to your tortoises, but even when you're working in a reactive manner a small change needs to be spotted as quickly as possible. Many years ago we decided to put our PC to good use and build an application which not only could help in this laborious task or record keeping but would go way beyond what paper could ever achieve. 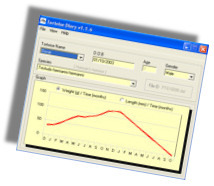 The 'Tortoise Diary' was born a tracking system which at a touch of a button could report the last years weight loss of 'terry' the tortoise in hibernation, a filing system for good house keeping one that could keep all the records neatly organised in together but then could fetch one instantly, a plotter which you could visually show the growth rate over a given time span to help diagnose health issues, weight gain or loss rate, and help to determine females which could be retaining eggs. Numbers are great for computers and calculators but when there's pages of figures for each tortoise nothing beats a plotted graph to see a clearer picture of his / her's development, If there had been no historical data recorded much of the knowledge we have now would most certainly be lacking. Welcome to the 'Tortoise Diary' ! ! ! You too could be doing your bit to help a world survey of tortoise's in captivity. 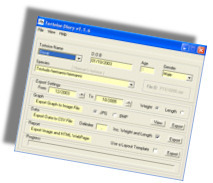 Select 'Save Target As' and choose a location for the download file. When the download is complete unzip and run the 'setup.exe' this will guide you through the install procedure, once installed the program will help you get started. If you have an existing version installed, then please uninstall it before updating to the latest. Previous records will be safe, newer versions have the ability to read records from older formats. "Tortoise Diary is a must - brilliant idea - Thank you ..."
"stacks of homemade notes can now all be found all in one place"
"I didn't realise how useful it would be to me, but now there's no going back"
"... thanks for a great little piece of software!" "we find it invaluable in keeping up to date record of our beloved tortoises." 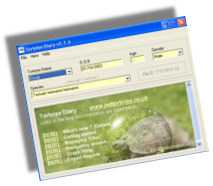 "we recently had a problem where we had to have our hard drive wiped and lost the tortoise diary, All dates and weights were backed up to a floppy disc, BUT..... the help we received was brilliant!..... A Huge THANK YOU." "Great little program. Makes record keeping so easy." If you would like to leave comments / feedback please email them in. security of your cherished tortoise(s). Online video tutorials added please see above on this page. Microsoft� Windows� 95, 98, NT, Me, XP, 2000, Vista. Microsoft� Internet Explorer 4 or later. Trial it free for 30 days with unlimited tortoises, all we ask is a small donation of £5 which enables us to continue to help you - this goes towards improvements, fixes, maintenance, development tools and hosting costs of the 'Tortoise Dairy' and www.pettortoise.co.uk. To obtain a license please go here - 'Tortoise Diary - License Page'. You don't need a PayPal account to make payment. As of v1.8 - Build and Print 'Security Identity Document' to help protect your tortoise(s). Online video tutorial help is now available please check above on this page for more information. We're already updating the graph module, a few new additions including photo identity have now been added in the latest version and can be downloaded from the links above. 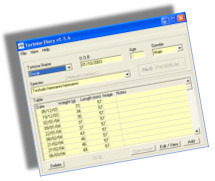 In order to let the 'Tortoise Diary' check for updates you may need to allow it on your firewall software. Current license holders will receive updates and newer versions free. Note: If you're upgrading, Please back up your data files and remove your previous version before commencing. 100% Vista compatible - Fixed for UAC enabled users. Before reporting any issues or bugs please check you have the latest version installed by performing the update as above. Feel free to contact us with comments and ideas.